Flameshot is a simple yet powerful screenshot tool with annotation feature. Other than Shutter, it’s another of my favorite screen capturing tools for Ubuntu desktop so far. Flameshot is written by C++ with Qt5 framework. It offers a system tray icon with ‘Take Screenshot’ and ‘Configuration’ menu options. While selecting a screen area to capture, many editing tool buttons appear at the bottom. And you can press right-click to show color picker, and Space to open the side panel. 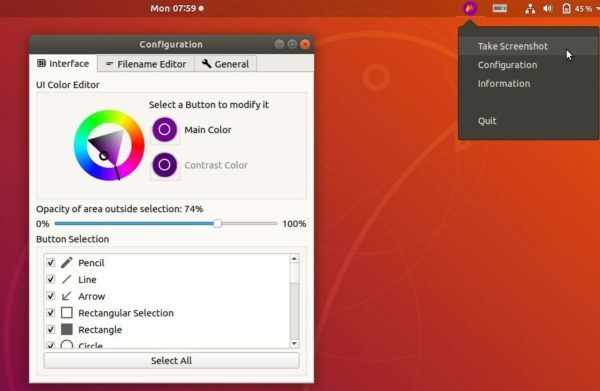 The software is available in Ubuntu Software for Ubuntu 18.04 and higher, however, Canonical won’t provide regular update for the package. then right-click the .deb package -> Open with Other Application -> Gdebi package installer. (install gdebi via command sudo apt install gdebi in terminal).